Roger Zanetti, better known as “Zaneth”, is from Yverdon-les-Bains near Neuchâtel, Switzerland. 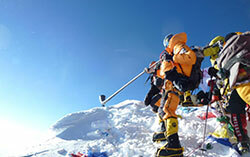 He was educated to be an electrical engineer at the prestigious Geneva Technical Institute. Some of his work was with simulators and robots. In addition to his work as an engineer, Zaneth has long been an entertainer. As a cabaret performer he plays guitar, sings and occasionally adds a little tap dance. 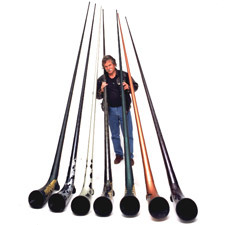 Over 20 years ago, Zaneth began playing the traditional wooden alphorn. Adding the alphorn to his performances, he demonstrates the singular ability to play the alphorn and guitar simultaneously. Zaneth has composed all of the music he performs. With his keen sense of humor, Zaneth may also be classified as a comic. He is a former member of the mime artist troupe known as “Mummenschanz” and performed with them for several years, which included two world tours. As a typical Swiss, Zaneth has always enjoyed the outdoors and all associated activities – hiking, biking, skiing and boating. And as a true alphorn blower, Zaneth enjoyed taking the instrument to play in the many natural settings and experiencing the various echoes and reverberations, but it is not easy to transport a two or three piece wooden alphorn – especially while biking or skiing. 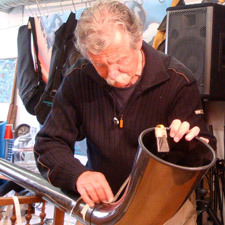 Zaneth also encountered serious damage to his instrument while traveling by air. Therefore: The New Generation High Tech Swiss Carbon Alphorn was born. Zaneth, in collaboration with a longtime friend, JeanFrançois Burkhalter, created the AlpFlyingHorn. Burkhalter has, for many years, been building high performance, award winning, tournament sailing yachts from this carbon fiber compound. 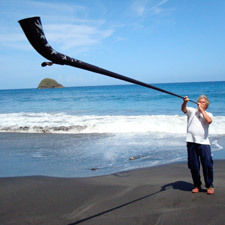 The long tapered mast on the boat gave Zaneth the idea for the “new age” instrument. Solid and lightweight – this seemed the answer to the transportation problems of the cumbersome wooden alphorn. With his AlpFlyingHorn, Zaneth won the Silver Medal at the 27th International Invention Fair in Geneva in 1999. The AlpFlyingHorn exhibit is always a highlight at symposiums. To date more than 1000 instruments were sold. I died January 13, 2014 to join the echo of life and I am happy that my family continues my passion.